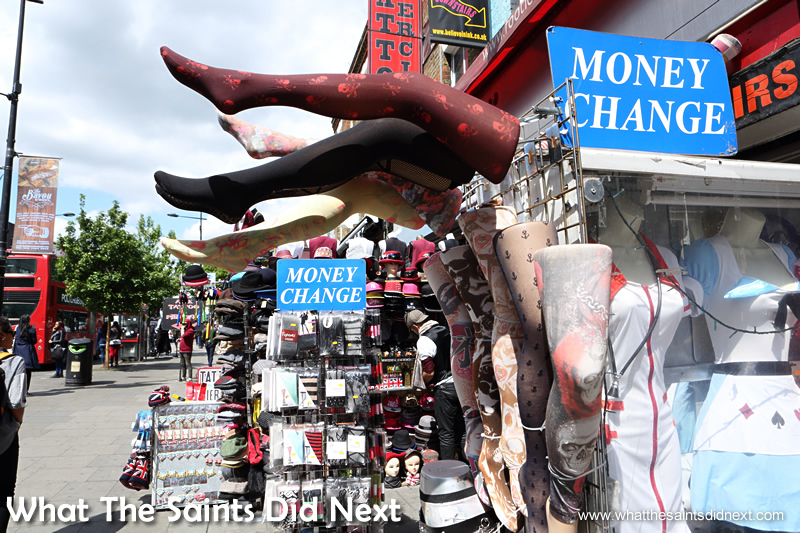 Just a few steps from the Underground station it becomes apparent Camden Market is different. 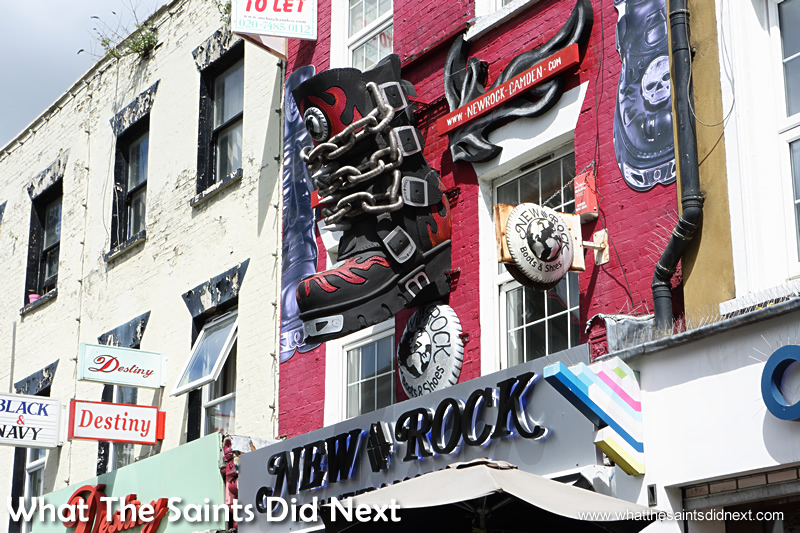 Around 500,000 people flock to Camden Town each week drawn by the allure of the Camden Market street food, quirky fashion and curios. It’s a hipster hangout spot and is London’s fourth most popular attraction. Even on our mid-week, Tuesday visit the place was fairly busy. Spilling out of the cramped Underground station onto the high street you instantly see, hear and feel why. Camden, teeming with all walks of life, is lined with an array of shops and building facades so whimsically adorned they’re a feature in their own right. It’s places that this that makes photographing London, great – there’s so much subject matter and cool locations for to do street photo shoots. We love it! Bold art on the walls above the streets. Loud and bold, these funky facades are a great feature. Above our heads were giant sized shoes stuck on the wall, skin-tight leather trousers and belly-button rings. Art comes in all forms and these shop fronts are certainly creative, giving the street a cool image. Having skipped breakfast we stopped at a pancake shop to warm and fill our bellies. 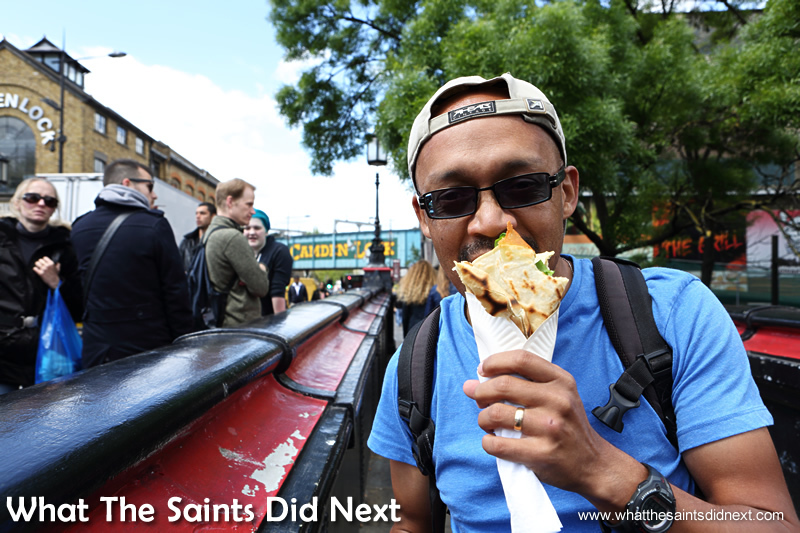 I was introduced to street food crepes at Portobello Market (London) many years ago and have had a weakness for them since. We watched as the ‘chef’ spooned and spread the batter on a flat skillet. 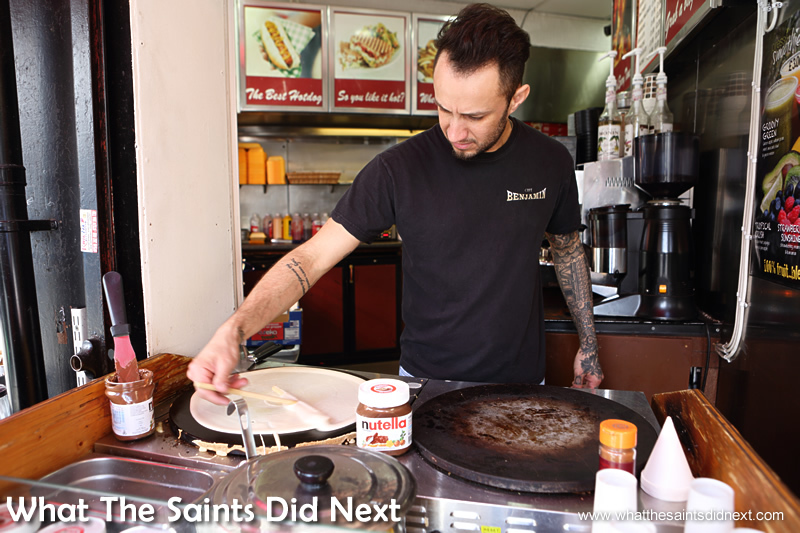 Next he expertly flipped it, then slathered on Nutella, sprinkled almonds and sliced banana. All cooked within four minutes. 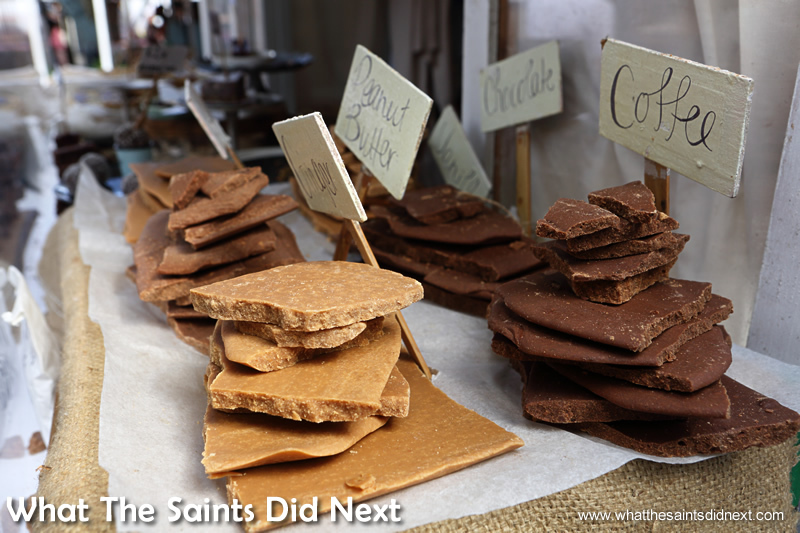 What’s better than the smell of warm chocolate sauce? Eating it! Yum! Our pancakes being prepared while we wait. 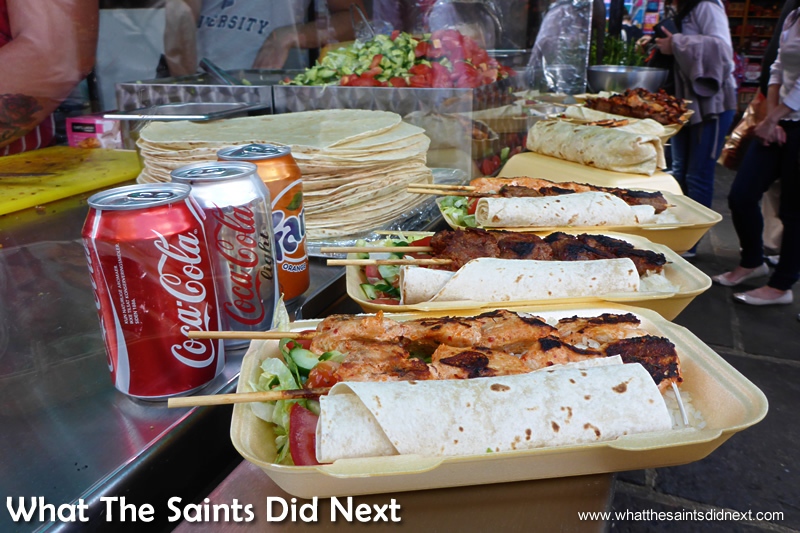 Camden Market street food. Darrin trying to not get his lips burnt with the cheese filling. Camden Market street food. There’s a choice of sweet or savoury crepes; strawberry, honey, maple syrup, mushrooms, ham, cheese and spinach. If you’re thinking of adopting the never-out-of-fashion gothic or punk look, this is the place to go. There’s an eclectic range of shops and stalls selling army surplus goods, vintage, alternative, young designer creations, and even high street brands; actually, it’s fashion for everyone. There are a number of tattoo and piercing parlours to finish off the look. 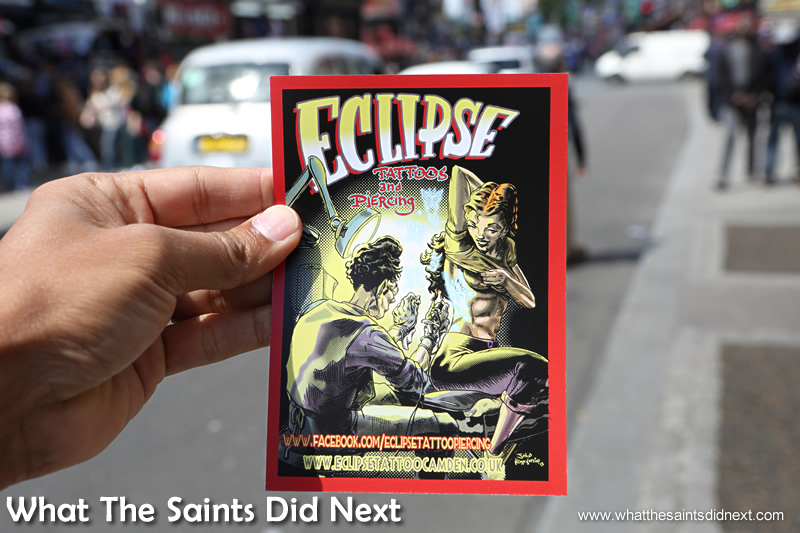 Leaflets are handed out on the street to tempt visitors into getting some ink. 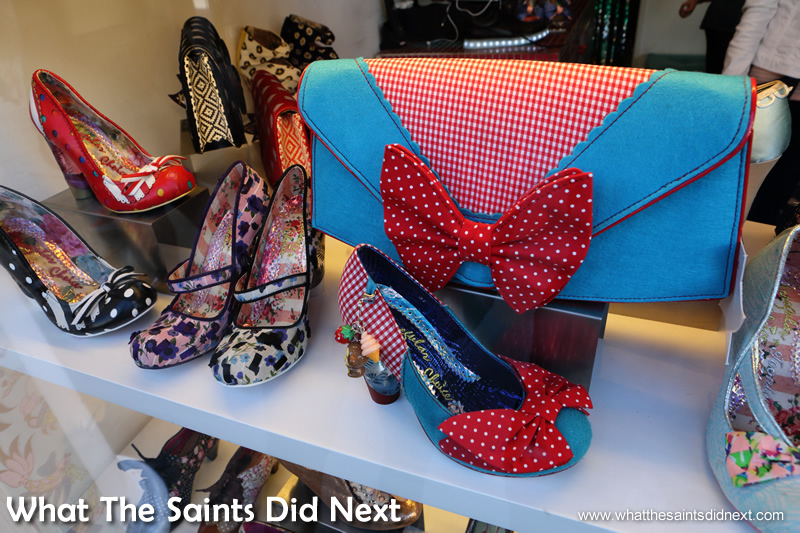 A unique style for shoes and handbags makes window shopping very exciting. Here I am doing the difficult research work for the blog! Canal boats moving through the Camden sunshine lends to a romantic setting. 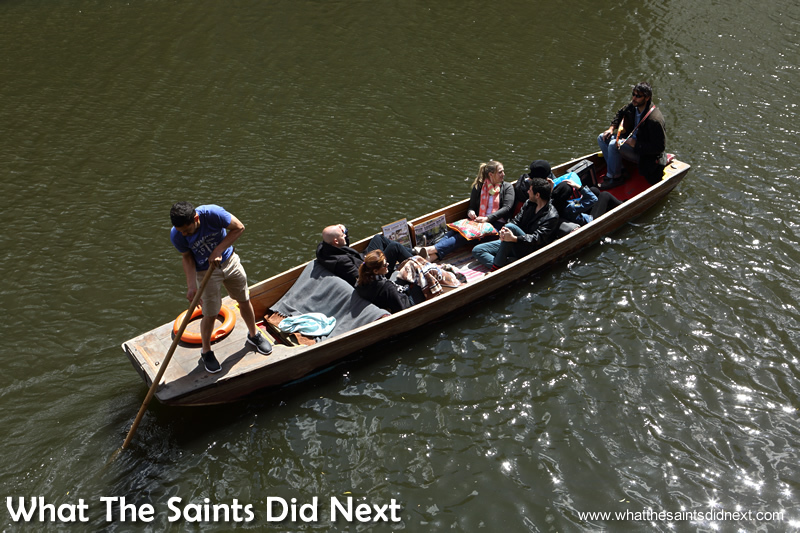 We moseyed toward the lock and river, still munching our generously sized pancakes, and peered down on romantics being serenaded on board a punt boat. The boatman seemed to be having trouble building up momentum and the singer sounded slightly off-key, but hey, the ‘punters’ looked happy. 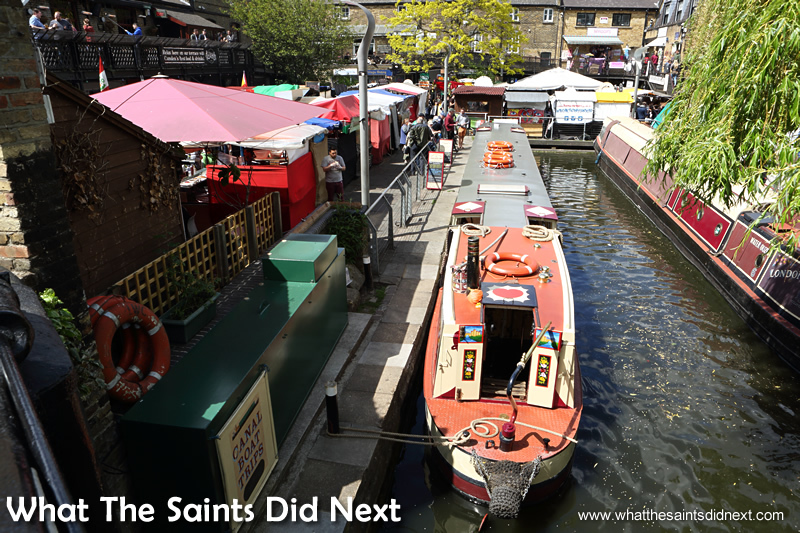 Camden Lock is full of boats and one way to skip the roads, is a romantic boat ride to Camden via Little Venice near Paddington. Unfortunately still full and belching from our pancakes, we wandered around the West Yard breathing in the delicious smells. Camden Lock’s Global Kitchen is famed for producing foodie delights from Malaysia, Brazil, the Deep South, Italy, Ethiopia and a host of other faraway countries. 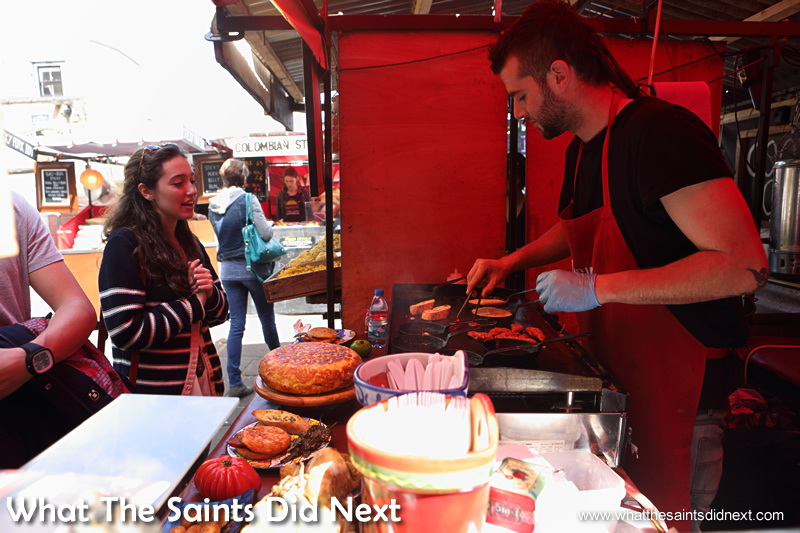 The market is also known for being good value, ie cheap, but we thought the prices a little steep at an average of £7 for take-a-way street food. Perhaps we were still in South East Asia pricing mode. But, perhaps not, as we overheard a guy quietly singing to his girlfriend, ‘money-money-money’, in reference to the prices. Very tempting food is on display everywhere. Camden Market street food. Customer waiting for their order to be completed. Camden Market street food. Turkish kebab sellers at the Ala Turko Kebabs stall. (Ali on the left). Camden Market street food. Ala Turko Kebabs food, freshly made and ready for hungry customers. 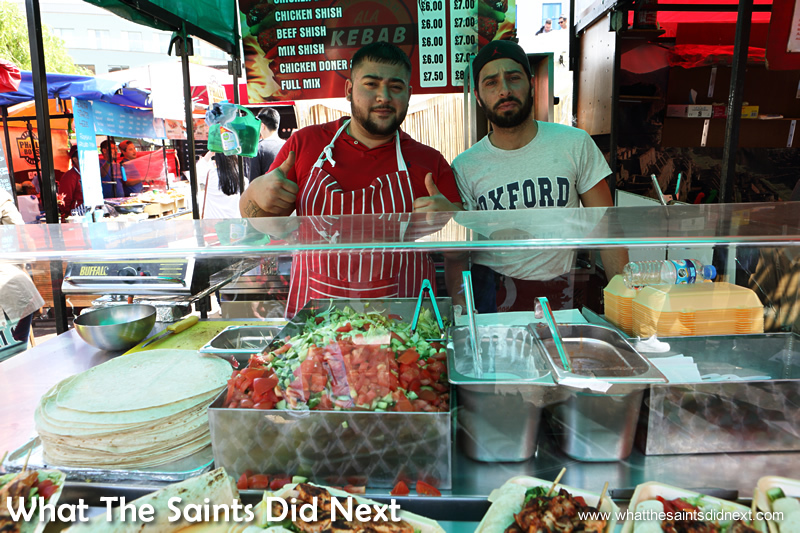 Camden Market street food. Nothing beats a spot of retail therapy even if just browsing. Strolling around clothing, accessories, leather goods, handicrafts and antiques stalls is especially enjoyable, as they are filled with quirky, unique and original items. No photography! 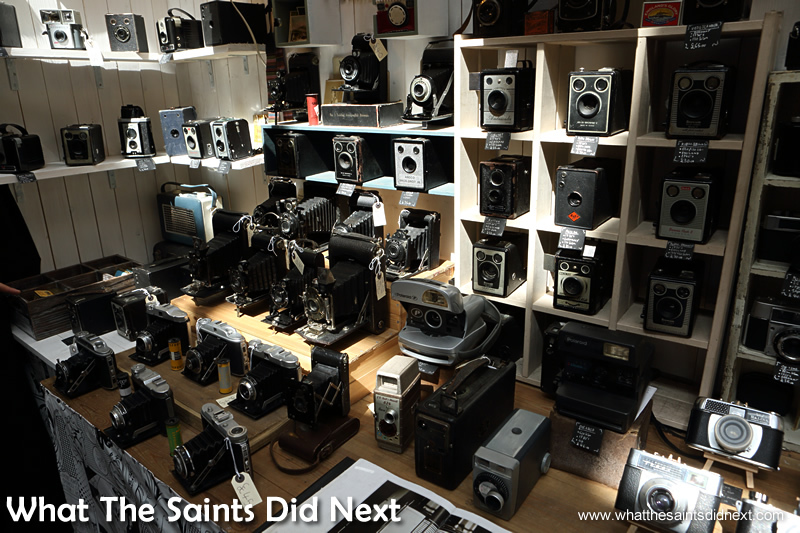 Vintage cameras on sale in Camden. 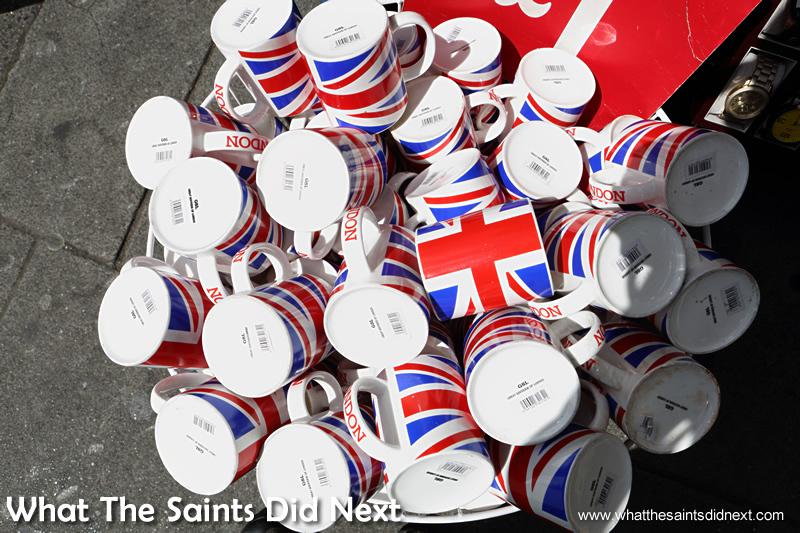 A collection of Cool Britannia mugs. 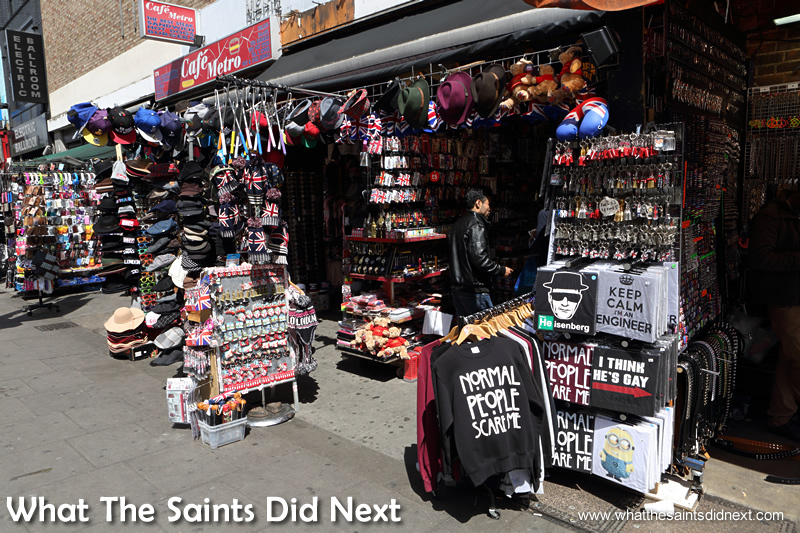 Essential tourist items sold here, including ever-popular selfie sticks. Despite Camden Market being one of London’s hottest tourist attractions many stall holders are not keen on tourists taking photographs. 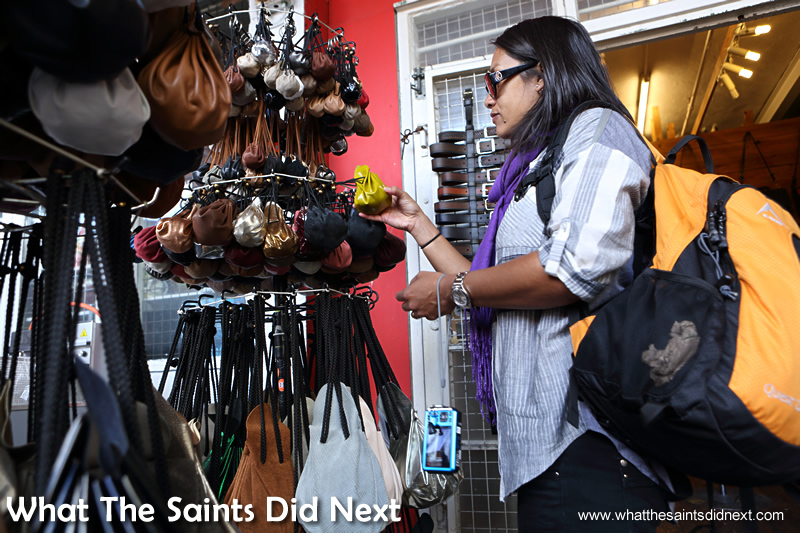 We could understand when copyright of an artist’s painting or similar may be compromised, but when the vendors selling cheap sunglasses got a little ‘snappy’ at selfie taking tourists it all seemed a bit excessive. 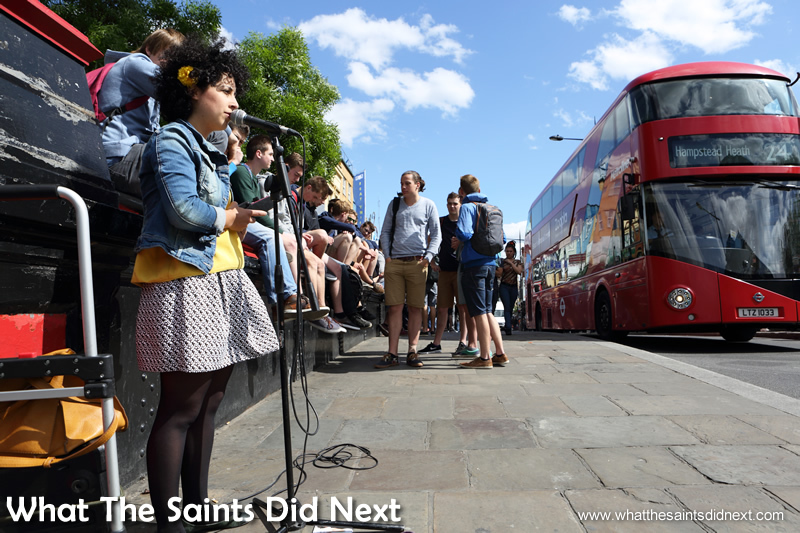 Overcoming noisy traffic, the sweet voice of an acapella singer floated across the street and grabbed our attention. She had a simple set up; a speaker and what we guessed to be a multi-track recorder. One by one she laid down different beats using her voice as an instrument, then synchronised them so it sounded like she had a five-man band. Beats down, she struck up with Ben E King’s, ‘Stand By Me,’ and sounded so good people crossed the street to fill up her purple hat with donations. Very clever, very powerful, very talented. Buskers and street artists add to the cool vibe of London, each have their own story and unique talents. A talented singer entertaining visitors to Camden. 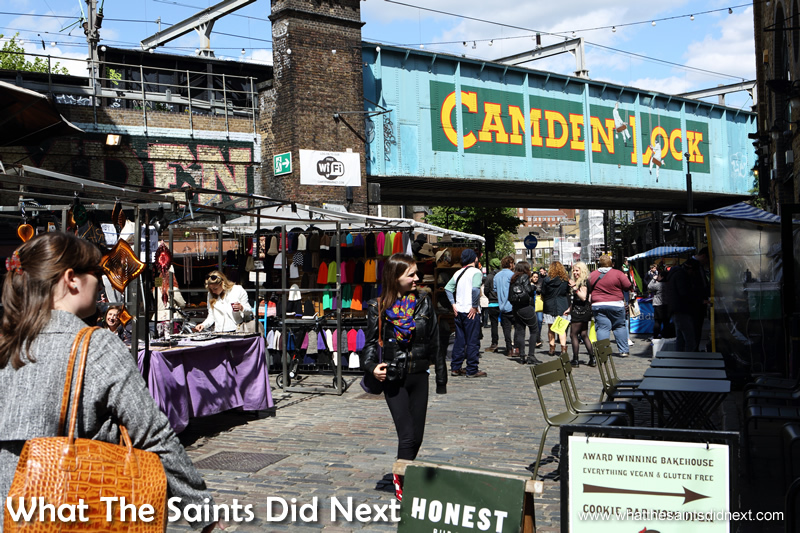 Camden Market began life as a small crafts market in 1974 and originally opened only on Sundays. Forty years later it has become a tourism magnet and real-estate hotspot. 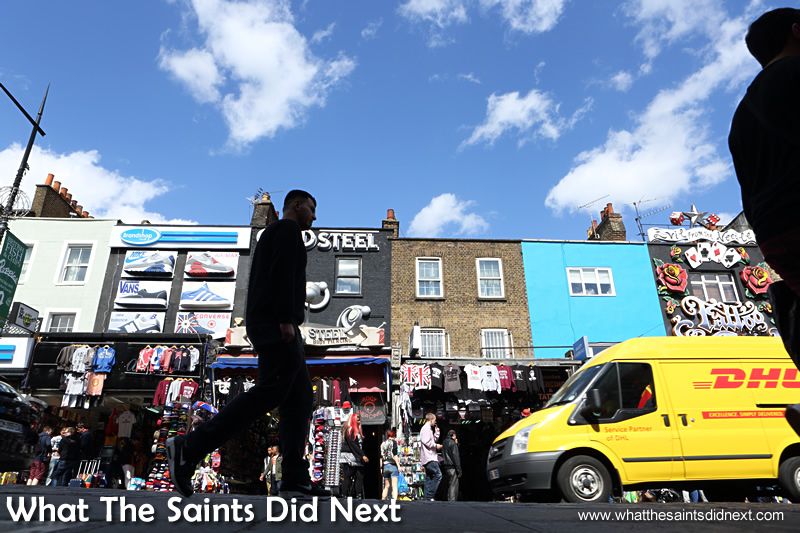 The seven markets that collectively make up ‘Camden Market’ have been snapped up by an Israeli billionaire for regeneration and development. There are mixed concerns the market’s unique character and culture may be lost. Either way, I’m glad we’ve experienced the ‘old’ version of this funky hipster joint. 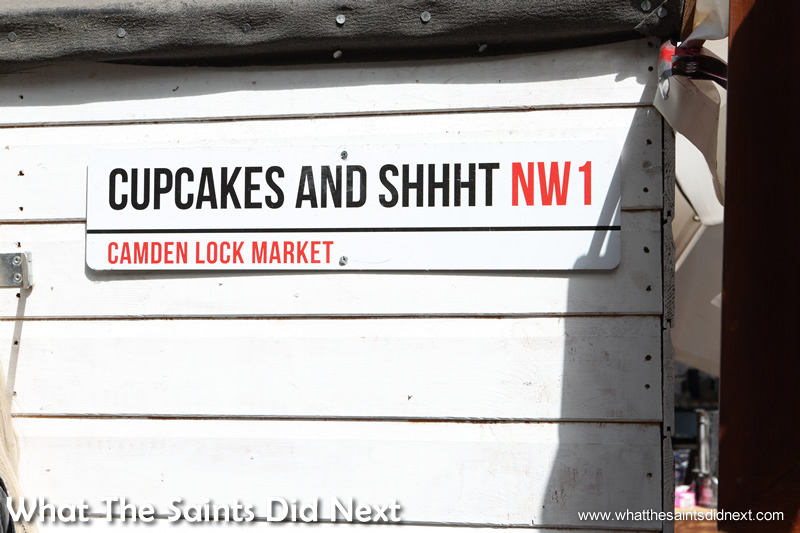 Camden Market is a cool place to stay while visiting London and there are plenty of accommodation options for tourists. 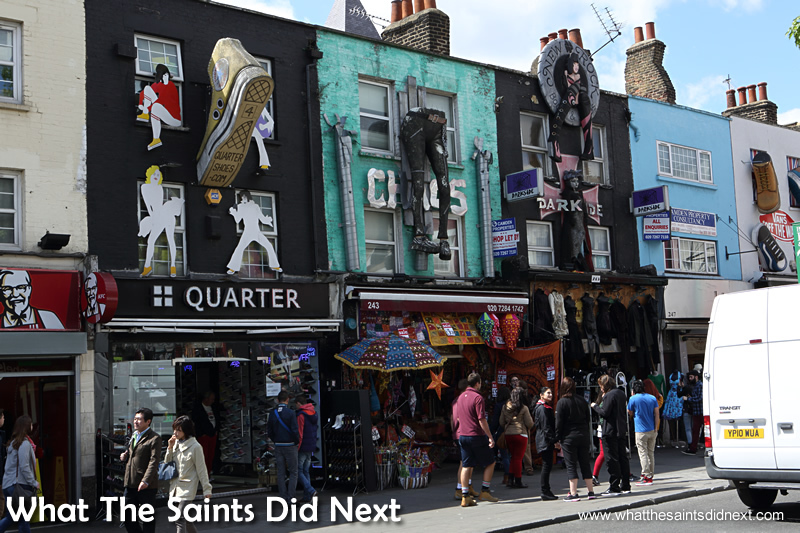 Click here for a comprehensive guide on choosing where to stay in London, including Camden. Camden Market is set for future re-development. Hi, my name is Roz Hill, I have been following your blog since you left St Helena. We have a friend Helen, who lived there, who now lives in Reading. I see you are in the UK . My blog is http //: umpteenthings.wordpress.com. Airbnb. Check out Shropshire listings. English Frankton.I think You would love it. Friends rates if we can fit you in.